The Ambanis reached Udaipur yesterday with designer Manish Malhotra, who posted a picture along with the parents of the bride. 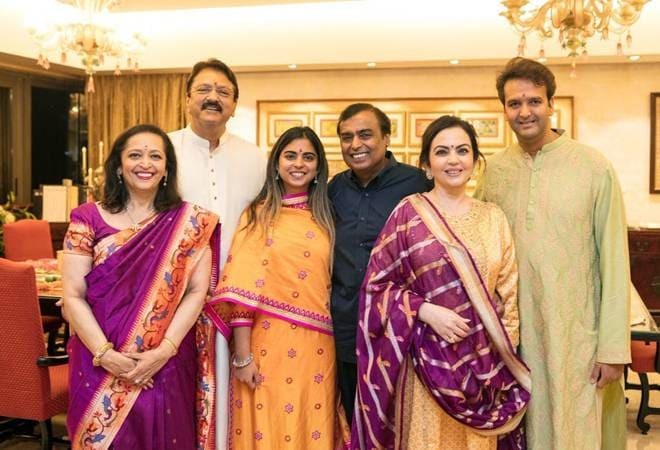 Mukesh and Nita Ambani's daughter Isha Ambani is all set to tie the knot with Ajay and Swati Piramal's son Anand Piramal on December 12. However, before that the families will kick off the wedding celebrations in Udaipur with a couple of rituals. The pre-wedding festivities will take place on December 8 and 9, after which they will fly back to Mumbai for the wedding at Antilia. The Ambanis reached Udaipur yesterday with designer Manish Malhotra, who posted a picture along with the parents of the bride. The mother of the bride, Nita Ambani can be seen wearing a red embroidered suit with a floral dupatta. While it is unclear, but the photo is an indication that the sought-after designer will be creating outfits for the bride and the family. Isha and Anand's wedding is expected to be a grand affair with performances by celebrities like Beyonce. The newly-wed Priyanka Chopra and Karan Johar are also expected to be in attendance. Joseph Radhik, who captured Priyanka-Nick and Anushka-Virat's weddings is expected to be the photographer at the wedding. While there has been no official confirmation, an Instagram post by Radhik featuring Priyanka Chopra and Isha Ambani is indicative of his role. "One of those happy moments when you see two Stories brides on stage!" he wrote. According to a report in India Today, 200 chartered planes have been scheduled to take off and land at Udaipur over this week. While some of them is due to the elections as well, around 40-50 planes will be deployed for the Ambanis. Even Vistara that does not have any flights to Udaipur will operate a few flights to the city. "Fly India's best to one of the most magical cities, #Udaipur! Vistara is operating special flights between Delhi, Udaipur, and Mumbai on 7th, 8th, 9th, and 10th December," Vistara tweeted. Fly India's best to one of the most magical cities, #Udaipur! Vistara is operating special flights between Delhi, Udaipur, and Mumbai on 7th, 8th, 9th, and 10th December. Additionally, over hundreds of luxury cars from Jaguars and Mercedes to Porches and BMWs have been booked by the Ambanis to pick and drop their guests from the airport to the venue. As per reports, the Ambanis have also booked multiple five-star properties for the guests as well as for the teams that will help them see this extravagant wedding through. Game of Thrones Season 8: New teaser shows winter is finally here and fans can't wait!